Queensland’s property supply to be absorbed by an increasing amount of interstate migrators, maintaining price affordability in the long term. Even better news QLD’s dwelling approval figures decreased by -5.2% over the past 12 months to June 2018. The decrease in dwelling approvals suggests that current property supply have a higher chance of being absorbed by increasing population growth, creating a balanced supply and demand market. QLD took out the bronze award nationally in the highest median growth in weekly family income (of 2.5% growth) category, which assists in managing a healthy household income. These two factors combined will result in property price stability for Queenslanders. QLD’s unemployment rate decreased by -7.8% over the past 12 months to June 2018, earning a bronze award nationally in the most improved unemployment rate category. This is exceptional improvement, bringing the QLD unemployment rate to 5.9% in June 2018 and quite close to the Australian average of 5.4%. This suggests that more Queenslanders are employed, improving the chances of renters becoming home owners. 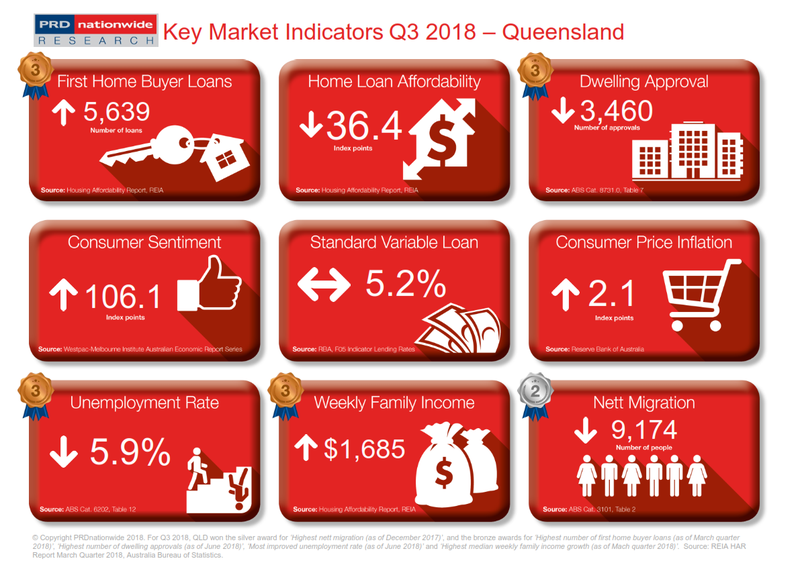 QLD took the bronze award nationally in highest number of first home buyer loans, recording 5,639 loans over the past 12 months to March 2018. This represented a 5.0% growth and will most likely increase over the next 6 months as QLD’s home loan affordability index reading continues to track above the Australian average (31.9 points), at 36.4 points in March 2018.